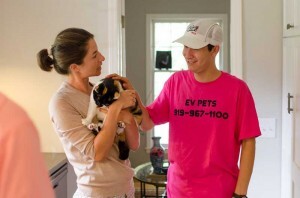 We had such a wonderful experience using EV pets to take care of our three cats when we went on vacation. Ewan and the rest of the team were professional and thorough throughout the entire process–from coming to the house beforehand to sending me an email with a photo after their visit. However, the best part of the experience was the comfort that our pets were being cared for by someone who was enthusiastic and happy to show them love and affection, and play with them! 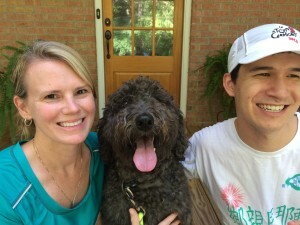 EV Pets impressed me with their professionalism and caring demeanor from the moment my “furry family” (labradoodle & 2 cats) met Ewan! 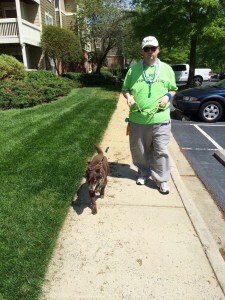 Training and experience with animals was evident when Ewan greeted and interacted with my dog prior to walking in our neighborhood. I felt very confident that Mali was safe and in good hands. Ewan’s report card or check list of tasks completed at the end of their walk assured me that EV pets was the right choice for our busy family. The staff at EV pets is both reliable and caring. They were so sweet to my old dog, and I never worried about whether he was getting his afternoon walk and belly rubs.